Pulse cookies in a food processor to fine crumbs, then pulse in sugar and butter until combined. Press crumb mixture evenly onto bottom and up side of a 9-inch pie plate. Bake until golden, about 15 minutes. Transfer to a rack to cool. Select 20 large strawberries as close to same size as possible and set aside. Cut remaining berries into 1/4-inch dice and toss with sugar and lemon juice. Let stand, stirring occasionally, 30 minutes. Drain berries in a sieve set into a large glass measuring cup. Add enough water to measure 2 cups. Transfer liquid to a medium saucepan and reserve berries. Sprinkle gelatin over strawberry liquid and let soften 1 minute. Bring to a bare simmer, stirring until gelatin has dissolved. Add diced berries, then transfer to a metal bowl set into an ice bath and stir frequently until mixture begins to mound, 20 to 30 minutes. Spoon 1/2 cup filling into pie crust and arrange reserved whole berries, stem ends down, on filling. Spoon remaining filling over and between berries. Chill pie until filling is set, at least 4 hours. 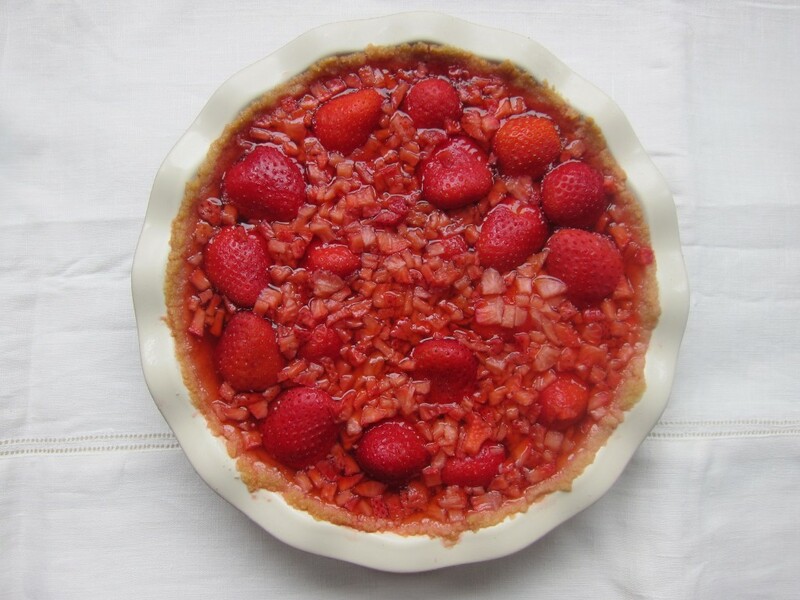 ·Pie crust can be made 2 days ahead and kept (covered once cool) at room temperature. ·Filled pie can be chilled, loosely covered, up to 1 day. ·While not as dramatic as whole large berries, if you find juicy small berries, cut them into quarters or halves. It may take longer for mixture to set, but pie will taste just as good.